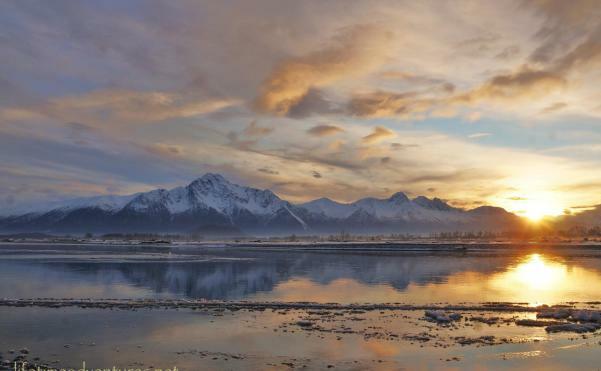 Sun rises over the Chugach Mountains on Dec. 22, 2014. Photo courtesy of www.lifetimeadventures.net. Christmas feels like it comes a few days early when you live in Alaska. While all of us certainly look forward to Dec. 25 and all of the holiday magic it brings, Dec. 22 is also a gift for everyone who lives here, courtesy of Mother Nature. That&apos;s when we started gaining daylight each day. When Alaskans travel, inevitably we get asked about how our winters are. People are often curious, and just as often, have a wrong stereotype about Alaska&apos;s winters. For the record, I don&apos;t live in an igloo, and I didn&apos;t have to shovel six feet of snow to get out of my driveway today. It&apos;s not 50 degrees below zero where I live in Southcentral Alaska. And yes, there are roads where I live. But the darkness? Yeah, you got that one right. It can be dark in the winter, and yes, it&apos;s just something we deal with. We&apos;re on the uphill climb now, though, and that makes us Alaskans happy. Today, in fact, we gain more than a minute of daylight. By Jan. 1, we&apos;ll be up to two minutes a day being gained. And before you know it, those seconds and those minutes start adding up, and by March, we&apos;ll actually have longer days than our friends to the south of us in the Lower 48. By June? Well, that&apos;s just plain awesome. Daylight gains are regular dinner table conversations here - everyone knows we gained exactly six seconds of daylight on Dec. 22, and most can tell you within a few minutes of when the sun is up, when it&apos;s going down and how much of a gain that is over yesterday. It&apos;s just an Alaska thing I guess. We try to make the most of our winters here by being active, hosting big community events and festivals and generally not hibernating. It&apos;s the best way those long winter nights - I mean, "shortening" winter nights these days!